Peter Ungar on "Evolution's Bite"
In a free, public discussion Peter Ungar talks about his new book, Evolution's Bite. Whether we realize it or not, we carry in our mouths the legacy of our evolution. Our teeth are like living fossils that can be studied and compared to those of our ancestors to teach us how we became human. 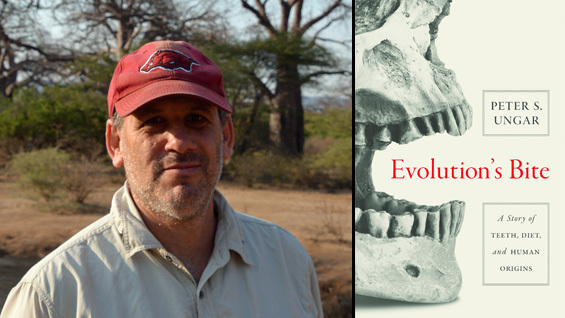 In Evolution's Bite, noted paleoanthropologist Peter Ungar brings together for the first time cutting-edge advances in understanding human evolution and climate change with new approaches to uncovering dietary clues from fossil teeth to present a remarkable investigation into the ways that teeth—their shape, chemistry, and wear—reveal how we came to be. Ungar describes how a tooth's "foodprints"—distinctive patterns of microscopic wear and tear—provide telltale details about what an animal actually ate in the past. These clues, combined with groundbreaking research in paleoclimatology, demonstrate how a changing climate altered the food options available to our ancestors, what Ungar calls the biospheric buffet. When diets change, species change, and Ungar traces how diet and an unpredictable climate determined who among our ancestors was winnowed out and who survived, as well as why we transitioned from the role of forager to farmer. By sifting through the evidence—and the scars on our teeth—Ungar makes the important case for what might or might not be the most natural diet for humans. Traveling the four corners of the globe and combining scientific breakthroughs with vivid narrative, Evolution's Bite presents a dental perspective on our astonishing human development.